This is a mix between a chili & casserole, just something I threw together one night. My family really enjoyed it, and you can control the sweetness by varying the barbecue sauce & amount of molasses used. Brown ground beef in pan, splash worcestershire on it while cooking. 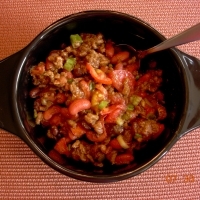 Once beef is cooked, mix with bacon, beans, tomato, green onions, and garlic in a casserole dish. In a small bowl, mix BBQ sauce & molasses. Pour sauce in & mix well. Bake at 350 for 20-25 minutes, or until thoroughly heated. Serves 4-6, depending on your appetite. Fantastic! We all loved this casserole. I did use 1 1/2lbs of ground beef and increase the BBQ sauce. The flavors were great. I also topped our with some shredded cheddar. Served with bestcooker's Sour Cream Cornbread. Good job with the photo!!! 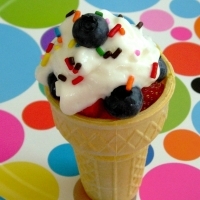 Looks so delicious! Like jrbaker's recipes? Never miss an upload!